Sipadan is widely regarded as Malaysia’s best diving and is up there with the best dive destinations in the world. Divers first started visiting Sipadan in 1984 and Jacques Cousteau described it as the best shore diving in the world. The tiny island that drops off 600m into the Sulawesi sea is famous for sharks, turtles, barracuda and humphead parrotfish, all of which are virtually guaranteed, but in fact you can see much more than that at Sipadan. All sorts of marine visitors pass by including whale sharks, thresher sharks, hammerhead sharks, manta rays and eagle rays. Most of the diving is wall diving along the drop offs. Currents are not normally a problem although can pick up at times making for exciting drift dives. Any level of diver can dive Sipadan, just watch your depth gauge. Visibility is usually excellent. Sipadan can be dived all year round and is very good all year round but the best time of year to dive is March to September when the sea is flat, the sun is shining and the visibility is excellent. July-August can get quite busy. Chinese New Year and Japan’s Golden Week holiday periods get booked out well in advance. September is a quieter month and a good time for big fish sightings. In January 2005 the Malaysian authorities declared Sipadan a protected marine reserve and now limit the number of divers with a daily Sipadan permit quota. They have also removed all accommodation from Sipadan Island. Regulations are enforced by the Sabah marine police and the Malaysian navy who have a large and visible presence in the area to ward off any threat from terrorist groups from nearby Philippines. It is possible to dive Sipadan by fast daytrip dive boat from Semporna but it’s an hour and a half journey each way to do just two dives. There is budget accommodation at Semporna but not much else. A far more pleasant option (although more expensive), is to stay in one of the all inclusive Sipadan dive resorts on Mabul Island or Kapalai. These delightful resorts are just 10 minutes boat ride from Sipadan and have some world class macro dives on their doorstep. There is currently just one liveaboard, the , that dives Sipadan and surrounding islands. There are about 20 dive sites around Sipadan island. Four to five days will give you a good flavour of the best sites but if you stayed a month you would not get bored. Many divers like to repeat some of the best dive sites daily such as Barracuda Point and the Drop Off. There is also a famous cavern/cave dive at Sipadan know as the Turtle Cavern or Turtle Tomb where unfortunate turtles have got lost and drowned leaving only their skeletons. Barracuda Point, at the eastern most tip of Sipadan Island is another Sipadan favourite dive site because of the sheer number of fish here and most divers want to do this dive site several times during their stay at Sipadan. Huge swirling schools of chevron barracuda can be seen in the currents. Schools can be so big that divers can swim up the middle of the funnel like swirl. This is one of the best places in the world to get photographs of barracuda. Large schools of jacks can also be seen here. The pelagic fish like the strong currents at Barracuda Point and divers should be wary of down currents. Grey reef sharks can be seen cruising the reef and manta rays make occasional visits. Much of this dive site is a wall dive although there is a 20m deep ledge where white tip reef sharks rest on the rubble bottom allowing divers to get very close for photos. As on all Sipadan dive sites there are dozens of green turtles and the humphead parrot fish can also be seen. Coral Garden dive site also has schools of barracuda and trevally. This is another wall dive with a large variety of soft corals, crinoids and sea squirts covering the wall. Clown trigger fish and Titan trigger fish are common as are parrot fish, wrasse and schools of snapper. Turtles also like this area and grey reef sharks can be seen passing by. 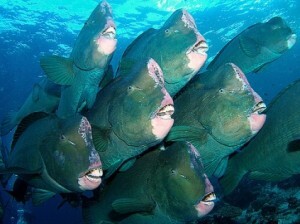 If humphead parrot fish are in the area you may well hear them coming as they all munch away on the coral with their huge teeth and the excrete plumes of fine coral sand behind them. These fish are big, weighing in at up to 85kg! The Drop Off is the dive site that made Sipadan famous. In the times when Borneo Divers had a resort on Sipadan Island it was easy just to walk off the beach and drop over the edge into one of the world’s best dive sites. If you were seriously overweighted you could keep dropping for 600m! This dive site can be credited with many of the best underwater photographs which are regularly featured in magazines. The wall itself is very attractive, covered in soft corals, sponges and sea fans. However most divers are here to look at the huge schools of fish all around including schools of jacks and barracuda. Squadrons of humphead parrot fish can be seen charging along the reef at shallow depths. Green turtles are bound to be seen as are white tip reef sharks. Grey reef sharks can be seen in the blue. Manta rays are occasional visitors to the drop off, usually when currents are strong. Currents can sometimes be strong at the Drop Off but normally they are quite mild and the dive is a relaxing drift. Visibility is good. This is truly a world class dive site. Night dives are also excellent at the Drop Off when the wall comes alive with shrimps, crabs and other crustaceans plus moray eels and parrot fish. Just to the north of the Drop Off is North Point. It is often dived in conjunction with the Drop Off when currents are running. It is similar underwater and is particularly attractive in the shallows when the sun pierces the water to light up the colourful soft corals and sea squirts. Turtles and white tip reef sharks are numerous as are large schools of fish. Located on the north west side of Sipadan Island, Hanging Gardens dive site is named after the mythological hanging gardens of Babylon. A ridge at 2m below the surface drops off to 70m where there is another ledge which the drops off into the deep. Soft corals of several colours hang from the ledges and down the wall. Gorgonian sea fans and sea squirts also cling to the wall. The wall itself is full of life including moray eels, scorpion fish, lion fish, gobies, shrimps, crabs and other crustaceans. Reef fish include yellow tail snapper, fusilier, wrasse and coral grouper. There are also parrot fish, titan trigger fish, clown trigger fish and sweet lips plus a myriad of smaller fish like anthias and damsel fish. Look in sea fans for long nosed hawk fish and ornate ghost pipe fish. Green turtles and white tip reef sharks are usually seen here and ribbon tail rays are occasionally spotted. Keep one eye out in the blue for chance encounters with scalloped hammerheads and thresher sharks. To the south of Hanging Gardens is a dive site called Lobster Lair which is a less popular dive site because it’s more of a critter hunting dive instead of looking for the big stuff. In the coral crevices divers can find all number of crustaceans including lobsters. There are also pipe fish, seahorses, frog fish and leaf fish plus scorpion fish and lion fish. Leopard sharks are sometimes spotted here. Located along the south east edge of Sipadan island, Mid reef has some of the prettiest and varied coral formations around Sipadan. Hard corals such as table coral, star coral and staghorn coral are complemented by barrel sponges, encrusting sponges and soft corals. Orange gorgonian sea fans, sea whips, feather stars and thousands of sea squirts are also in abundance. Of course there is the chance to see the big species here such as barracuda, trevally, humphead parrot fish and white tip sharks. You are sure to bump into a few green turtles and and probably a grey reef shark but after a while of diving at Sipadan you may long to study some small fish for a change. Sipadan dives are unlike so many dives in other places where the distant shadow of one reef shark out in the blue can cause so much excitement. At Sipadan divers see so many sharks that they become indifferent to their presence and just stop counting. The same can be said for turtles. Some of the smaller reef fish at Mid reef are cube box fish, puffer fish, porcupine fish and leaf fish. Lion fish can be found around barrel sponges. Scorpion fish can be harder to spot as they are so well camouflaged on the reef. Red tooth trigge rfish are numerous as are schools of banner fish and yellow tailed snapper. Unicorn fish and parrotfish can be seen as can harlequin sweetlips. Divers need to be aware of their depth here, especially when currents are strong and down currents can be present. Most dives are just a gentle drift along the wall. South Point is the best Sipadan dive site to see hammerhead sharks. It is possible to see schools of hammerheads but they are usually seen at 40m or below. Hammerheads like the deep water and strong currents. When the waters are a little cooler they may be seen shallower. It is a similar story with Thresher sharks which can also be seen here and also prefer deep water. Currents can be strong here so South Point is typically a drift dive with many divers choosing to move away from the wall and stay deep for as long as possible. For those not lucky enough to see something as exciting as a hammerhead or thresher shark the wall still has plenty to offer and of course you will see green turtles and white tip reef sharks plus schools of jacks. Scalloped hammerheads are also a possibility at Staghorn Crest on the west side of Sipadan Island. The dive site is names because of the proliferation or staghorn coral, a particularly robust species of hard coral that grows quicker than other coral species and can dominate a reef. Corals are healthy here and grow to great sizes. Black coral is also prolific. In the afternoons the sun pierces the water at an angle and makes this reef a photographers dream. However, divers looking for the big stuff should swim out away from the reef to scan the blue water for sharks, manta rays and whale sharks. Currents can be strong here, visibility rarely drops below 20m and is normally above 30m. Just to the south of the Drop Off entrance, at 20m depth is the entrance to the Turtle Cavern. The cavern, which is actually a series of interconnected caves, is sometimes referred to as the turtle tomb because of the number turtles that have got lost inside and drowned. Their skeletons make an eerie sight. On the entrance to the cavern skull and cross bones signs warn of the danger to divers. The caverns can silt up quickly to reduce visibility and only those properly trained should consider entering. Several off the Sipadan resorts run short courses to guide divers into the caverns. Located at the south of Sipadan Island Turtle Patch is slightly different to other Sipadan dive sites because it doesn’t drop straight down into the abyss. First it slopes off in stages to 40m. Then it drops into the abyss. Currents can be strong here so this dive is often done as a drift dive. Sipadan boat captains drop divers in and then drift with the bubbles so that when the divers surface the boat is right there waiting to pick them up. Large schools of trevally can surround divers here and as the name suggests turtles are prolific. There is a larger turtle population at Sipadan Island than anywhere else in the world, divers will see dozens of green turtles at Turtle patch and at most other Sipadan dive sites. Hawksbill turtles can also be seen in lesser numbers. The turtles are protected around Sipadan (although they are hunted for their shells, eggs and meat elsewhere in Malaysia) and the touching of them is strictly prohibited by the local divemasters. Divemasters seem less strict however about divers touching the coral, an area that needs improvement. On the north west tip of Sipadan Island is the West Ridge dive site. This dive site is prettiest in the afternoon when the sun lights the reef from the west. Large black coral bushes are numerous. Reef fish include oriental sweet lips, yellow tailed snapper, coral grouper and Moorish idols. Anemones can be seen with their resident anemone fish. Green turtles feed here. Lucky divers may see Napoleon wrasse. Located along the south east edge of Sipadan island, Whitetip Avenue is a wall dive where you will see lots of white tip reef sharks, but then you will see lots of whitetips on most dive sites around Sipadan. This dive site could just of easily been called Barracuda Avenue or Turtle Avenue. Still it’s nice that a dive site really does live up to it’s name, most of us have dived at a “Shark Point” and not seen a single shark. White tips are very placid and cruise past slowly giving divers time to focus their cameras. Divers should keep one eye on the deep blue though because it’s not uncommon to see hammerhead sharks or other large species. Grey reef sharks are common and there is always a chance to see big schools of barracuda and jacks. Hard coral species are healthy on Whitetip Avenue with plenty of acropora corals. Orange gorgonian sea fans are impressive. Sea whips, feather stars and sea squirts add some more colour. Reef fish include trigger fish, parro tfish, grouper and wrasse. This is a good dive site to hunt for some smaller species like long nosed hawk fish, or fang blennies. Turtles can be seen feeding here. Currents are normally mild and visibility is good. Less experienced divers should watch their depth gauges carefully as the clear water can fool divers into thinking that they are shallower than they actually are. This dive site, like the rest of Sipadan Island, drops off to 600m.